The education methodology has also evolved with technology and the increase of the diversity of teaching materials available to children. You can find online reading programs and educational materials free, or you can purchase different programs to speed children’s reading learning at very affordable prices, which at the end is synonymous with an excellent investment. Parents can find reliable methods where children can learn at home while playing alone or in the company of their friends. Research does not lie. It proves that children who work in their literacy at home have 56% greater success in school, exceeding the average school achievement in that area, compared to the rest of the classmates who only practice in the classroom. Online reading programs are created to help children improve their reading comprehension skills and develop a taste for books. They are designed for children of all ages, and with different learning speeds, while they reach each level, they acquire a higher potential for reading and a better spelling in consequence. They are oriented to go beyond reading learning only. As kids become skilled readers, they will have better academic performance throughout their lives. 1. 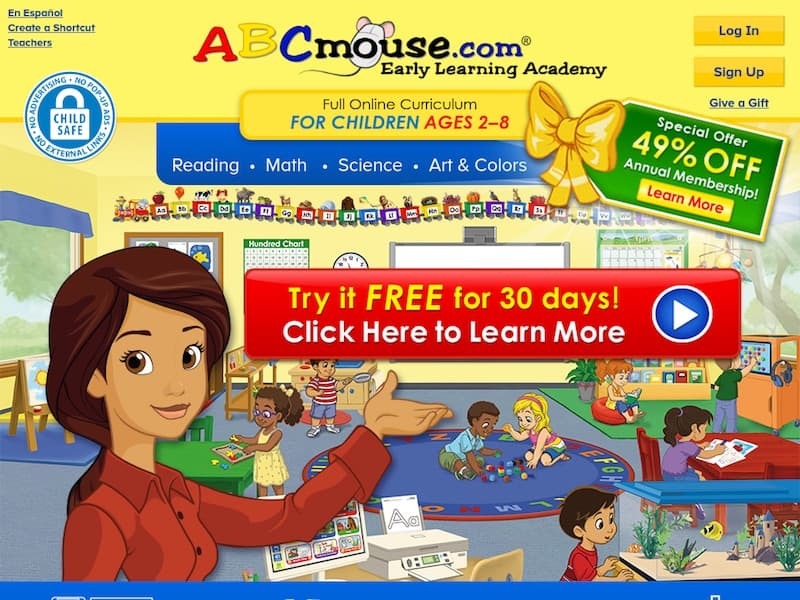 ABC Mouse: Educational Games, Books, Puzzles & Songs for Kids. This online reading program structure has six different levels according to your progress. Each stage of reading is designed by certified teachers and specialists in children’s learning so that parents can be sure that they will learn from reliable and safe materials. What parents like most, is that children can click on any part of the page. Therefore the learning experience is unstoppable. There are not any links to unrelated sites, so kids are very unlikely to leave the website. The colorful and fun graphics will make the kids have fun instead of feeling the pressure to learn. This program does not try to sell you DVDs, download files, software or any other materials through your email so that your child does not have to leave the site at any time avoiding the Internet risks. Their progress is always saved to give you vital feedback, but this also helps to prevent tedious repetitions as your children can continue their lessons at any time and anywhere in the world. ABC Mouse contains a small section of testimonials and awards that they have received for the quality of their work, such as the “Parent’s Choice Award”. The best part is that you can try it 30 days for free. 2. Headsprout Online Reading Program. 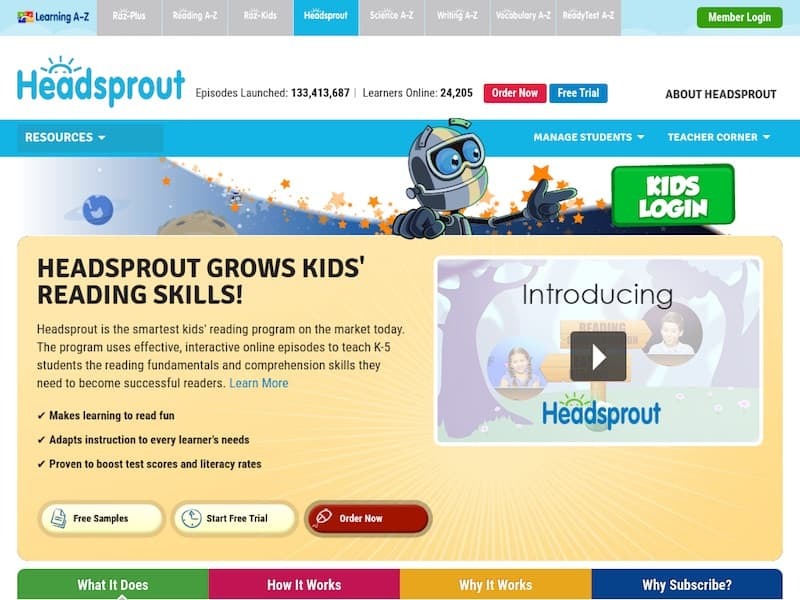 The makers of Headsprout online reading program describe the service as the smartest reading program on the market. Its goal is to provide parents and teachers with a flexible and individualized reading solution so that each child advance at his own pace. They intend to include early readers, children who read above grade level, and infants with reading problems. The Headsprout reading program is available as interactive episodes, and the skills taught successful guarantee readers who will get this valuable habit for life since it will not provide them only fluent reading skills, but it also will expand their vocabulary and comprehension levels. The materials used for this program include bright colors, friendly characters and other animated characters that will keep the little kids interested. Also, the motivation and self-esteem have a crucial role, because when the reader fails his answers, the software will encourage him to try again. 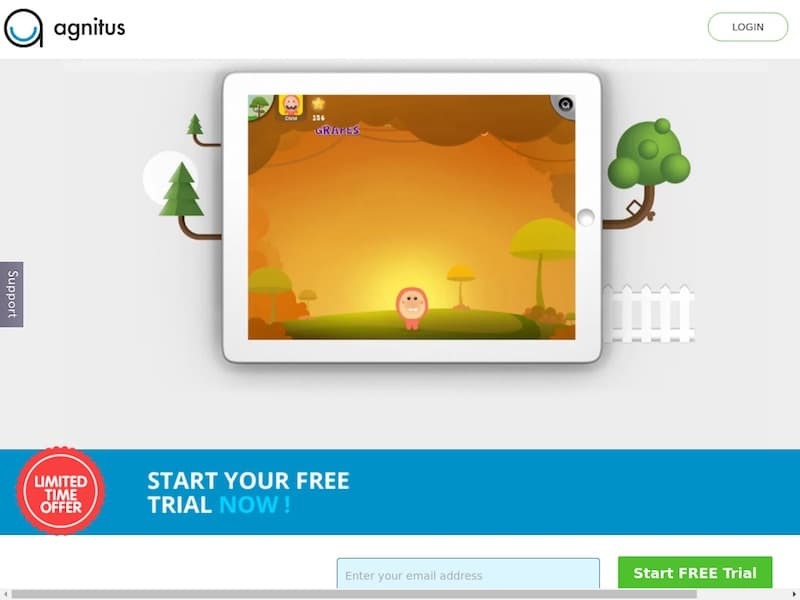 Agnitus combines research and technology for children from pre-school to third grade. They guarantee the mastery of a group of skills for your kid, like recognition of colors and forms, elementary count and reading in the section Agnitus Interactive Books, where they transform classic and favorite stories in cool interactive multimedia where they will practice their language. This online reading program stands out for allowing the child to learn each letter through a touching device where their fingers will follow the shape of the letter assigned and with the help of sound and graphics, their memory will store the essential information they need for advanced levels. In Agnitus children will learn music, the world, human skills, shapes, colors and letters, while their brain gets reading, comprehension, writing and general culture skills. The quality of this program has reached the creator’s several prizes in early childhood education, which show at the bottom of their website. Reading Bear gets your kids’ attention as soon as they see the little bear in the opening window. It is without hesitation one of our favorites because it is a free program to teach your children the vocabulary through presentations with sounds and illustrations, which much help in their introduction to the reading world. 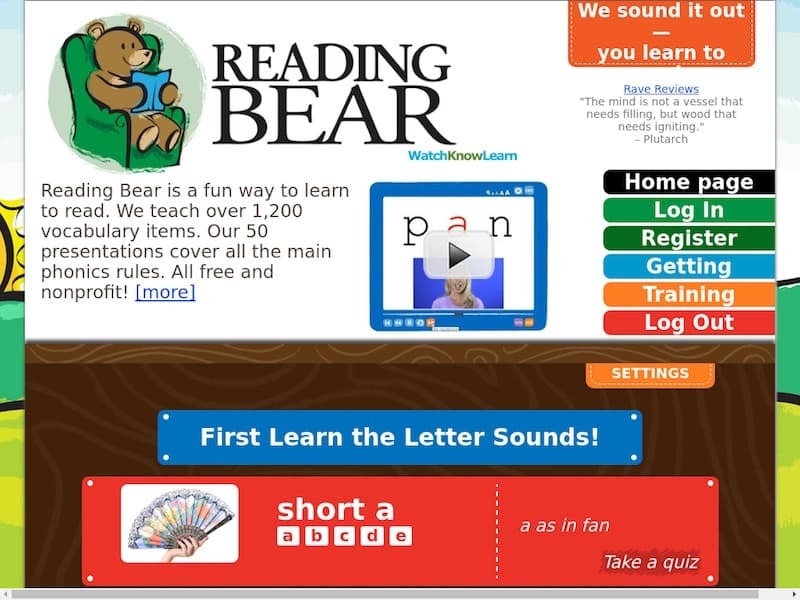 Fun is essential for Reading Bear, as it teaches more than 1,200 vocabulary words in 50 presentations on an easy to understand the platform and with friendly instructors. Their teaching method of this online reading program is systematic and progressive, and thanks to the phonetics they use, children can learn necessary words in an initial phase, and later learn more difficult skills to form small sentences. Sooner than you think, your child will take the books you have at home and ask for more things to read. 5. 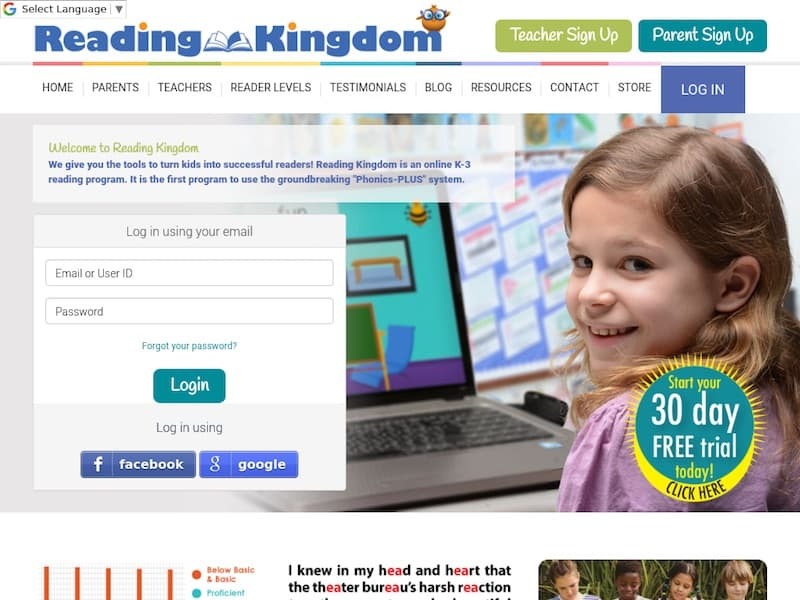 Reading Kingdom: Reading Books, Programs & Activities for Kids. The Reading Kingdom was created by the psychologist of the University of Cambridge Marion Blank as support to parents and teachers. This reading program provides the best tools to develop 6 skills to make your children excellent readers. Each level adapts to each child’s capability of learning and provides individualized instructions. On the site, you can find testimonials from teachers that support their effectiveness in children’s learning. Even Dr. Suzanne Goh, a specialist in pediatric neurology and autism, as well as Dr. Psychiatrist Jeffrey Lieberman of Columbia University, among other health and research professionals, approve the development of this method for education. The great news is that you can try this online reading program for 30 days to test if your kids like it. It is a handy website for parents, but even more for teachers. Here, teachers have the opportunity to evaluate each student through reading comprehension tests. This website won CODiE and EDDIE Awards for being extremely useful in the classrooms throughout the country. 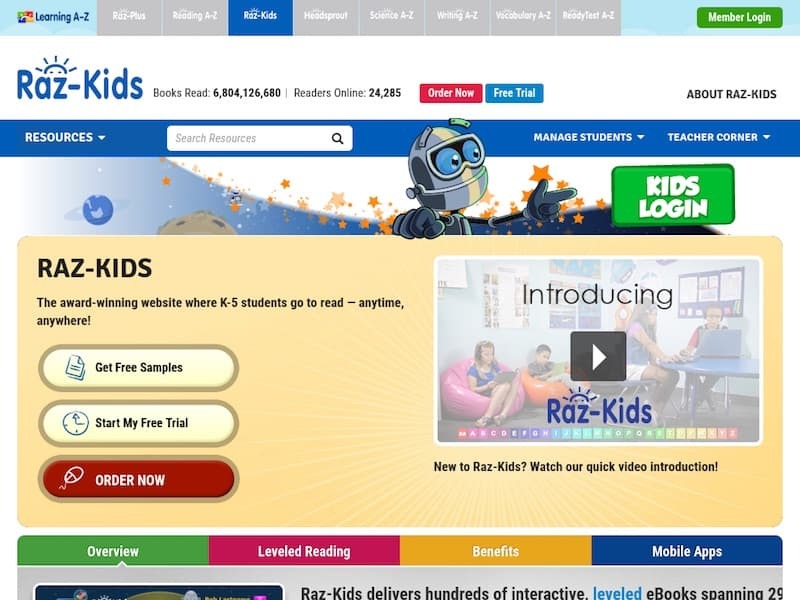 In Raz-kids website you can find up to 400 eBooks and eQuizzes with different learning levels for students in two languages, English and Spanish. This site will develop a perception of other cultures, and the skill t learn different languages, which will open them opportunities and will allow them to have better jobs in the future. 7. K5 Learning: Online reading program and math for kids. K5 Learning is one of the most popular online reading programs. The goal of this program is to teach children to read with the help of phonics, words, vocabulary and reading comprehension. It also has a spelling program with 150,000 words and an essential mathematics section. The mathematics part includes numbers and basic operations, geometry, units of measurement and algebraic thinking. It might sound complicated for small children, but the website shows everything at an elementary level with attractive and fun graphics. K5 Learning guarantees that your children will stand out among other students who only learn at school. 8. 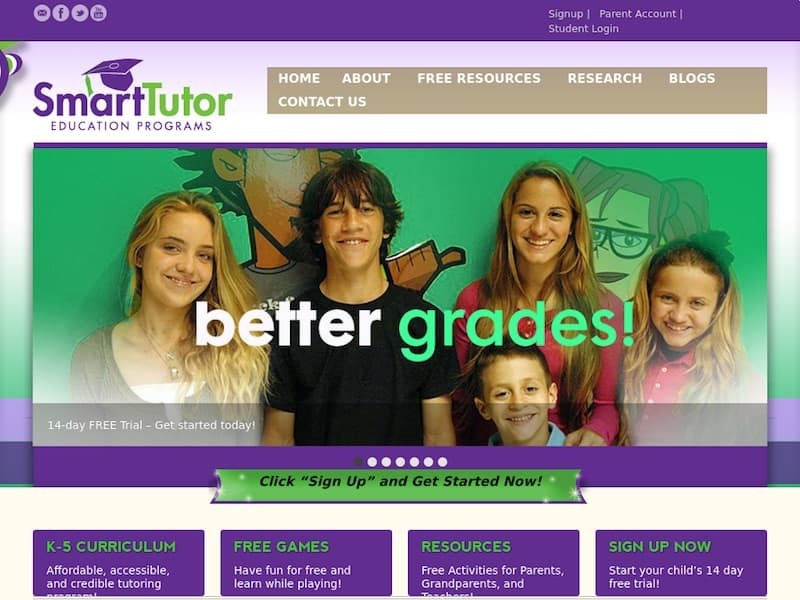 Smart Tutor Education Programs. It is known as a personalized online program for those parents who want their children to build reading skills while having fun. It also includes mathematical exercises that will trigger their appreciation for numbers. It is an ideal educational supplement for holidays or after school that will reinforce their learning and positively impacts their school performance. What sets Smart Tutor apart is that aims both young children and a bit older children. Its high-impact approach focused on maintaining children’s motivation, demonstrates its effectiveness for students with learning problems, special needs, and gifted students. The level of teaching will be determined through a diagnostic test that will detect the strengths and weaknesses of your child to create an individualized program according to their needs. For Smart Tutor, all children can achieve a high level of education and learning, only that each one requires their own time and technique.